February 2013 (Dubai, United Arab Emirates): Empire Aviation Group (EAG), the Dubai-based aircraft sales and aircraft management specialist and operator of the region’s largest fleet of business jets, has taken its first new aircraft of the year under management. The Gulfstream G450 is an advanced large-cabin, long range business jet and joins EAG’s extensive fleet operating out of Dubai International airport. 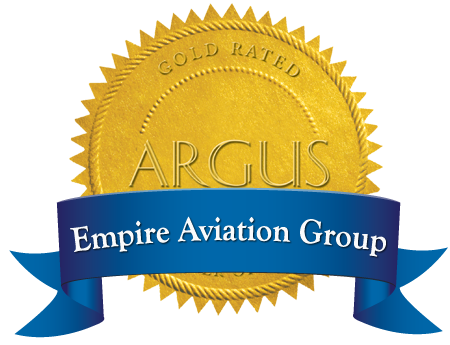 The aircraft will be managed by EAG on behalf of a private owner for personal use. The Gulfstream G450 can reach a maximum operating speed of Mach 0.88, and can carry eight passengers and crew up to 4,350 nautical miles (8,056 km) at the normal cruise speed of Mach 0.80. The G450 offers intercontinental range, easily linking Dubai-London and Mumbai-Geneva, non stop, and can access high altitude airports. The aircraft offers an array of advanced avionics and navigation suite in the cockpit (including Enhanced Vision System and Heads-Up Display) and onboard technology in the cabin, enhancing control for pilots and comfort for passengers – including fresh air and soundproofing. The G450 incorporates the advanced Elite Interior design which includes premium features such as the most advanced cabin technologies, including iTouch cabin controls. The aircraft can be configured for up to 13 passengers with berthing for six. Steve Hartley, Executive Director of Empire Aviation Group, comments: "We are delighted to take our first aircraft of the year under management and the G450 is a tremendous addition to our managed fleet and a sign of the high level of confidence that aircraft owners have in our team. Our aircraft management services are the core of our regional business and we continue to attract new aircraft owners looking for professional management services. The G450 offers great operational reliability and passenger comfort and comes with the strong support of the Gulfstream global network. Large cabin, long range business jets are very popular amongst aircraft owners in the region and they can reach most major global cities non stop." Empire Aviation Group operates the Middle East’s largest managed fleet of private jets from its base at Dubai International, with over 20 jets under management on behalf of their owners, several of which are available for charter. EAG offers private jet charter, charter brokerage services anywhere in the world, and medical evacuation/assist.